Considering the amount of fun that kids have dressing up in their Halloween costumes, don't you think more holidays should involve wearing fun outfits? There would be more interest in Presidents' Day if children put on full costumes of our nation's leaders, wouldn't there? The Lil Bunny Infant Toddler Costume from Costume Discounters comes complete with a lined body, slip-on booties, separate hood with floppy ears and even a soft plush carrot. And, by the picture, you can see just how darn cute it all is when it's put together. Available in sizes from 6 months to 2T, I was impressed with the softness and high quality of this bunny outfit, from head to toe. The body zips open and closed up the back but also includes snaps on the legs for easy access to diaper changes, a must-have for bunnies on the go. The oversized booties have a non-skid bottom and elastic similar to socks to keep them on - which, for the most part, they did. Big Sister E and I had a discussion about how the tail on the Lil Bunny Infant Toddler Costume could have been more cottontail-looking (instead of being round and fluffy, it resembles a dog's short tail) but that doesn't take away from the overall cuteness of this look. She could still peek out from underneath, however, and only tugged on the ears to try to do some adjustments a few times. Also, I grabbed an extra pair of her socks that were lying nearby and, after sticking them in the back of the hood, it stayed up and out of her face just fine. The extra room would be perfect for using this costume for a chilly Halloween because a warm hat would fit underneath easily and comfortably. As well as being adorable and well-made, this Lil Bunny Infant Toddler Costume sells on Costume Discounters for the lowest price you'll find online - guaranteed! Their Low Price Guarantee ensures that if you find the same costume for less elsewhere, they'll not only match it but take an extra 20% off. Considering a cute outfit like this one could be used for Easter, Halloween and the sweetest spring pictures, you could really get your money's worth. Whether you are searching for Easter Bunny Costumes, Halloween or dress-up outfits for adults or children or just the perfect wig, Costume Discounters has it all. She's too big now, but Little Sister B would definitely have been adorable in the Infant Monkey See, Monkey Doo with Banana Romper (at left). 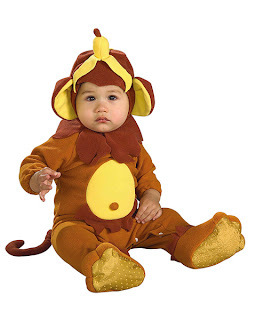 Is there a holiday coming up that involves monkey costumes? There should be! Thanks, Costume Discounters, for providing a site that is fun to browse while saving everyone money. With all of the themes, characters and costumes offered, it's hard to pick a favorite! And, even though you won't be bringing me mail on Easter you're still appreciated, so thanks, Mail Carrier. Oh, and that bunny costume? SO DARLING! That is just Too CUTE!!! Really ADORABLE!!! HAVE A NICE EASTER DAY!!! Oh so cute. Just coming by to wish you and your family a Happy Easter! Those are So Cute! Your two little ones always look so happy...guess they love getting new products to try out as much as mom does! I have something for you on my blog! Hope you'll join in! Stopping by from Friday Follow, I hope you'll follow me back! How precious! I wanted to wish you and your family a very Happy Easter! We dressed Sophia up as a monkey for her first Halloween. That exact monkey costume you used on your post!